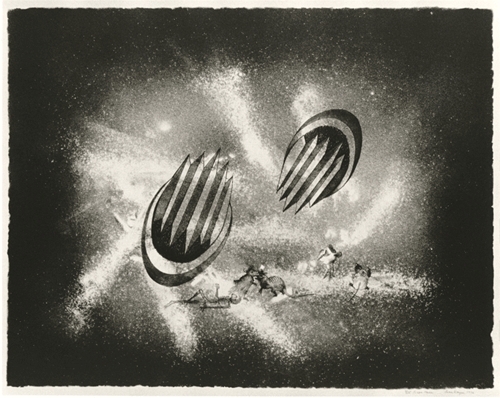 June Wayne founded the Tamarind Lithography Workshop in 1960 to foster collaborative printmaking in the United States. In 1970, Tamarind moved to Albuquerque under the auspices of the University of New Mexico, and four years later, Judith Solodkin became the first woman to graduate from the Tamarind Institute with the title Master Printer. In 1996, Wayne and Solodkin worked together for the first time. A PBS special, “A World of Art: Works in Progress,” documented Wayne’s month-long trip to New York City to create the prints now on view in The Collaborative Print: Works from SOLO Impression. “A World of Art” chronicles June Wayne’s artistic vision as she creates prints and discusses the ideas behind her work—the tension between the visible and invisible, near and far, good and evil, and the unknown and the known. Instead of focusing on the contrast between these forces, she pulls them together. She is fascinated by the “interplay of the aesthetics of science and the aesthetics of art” and the power that the two worlds bring to each other. Wayne often visits the Jet Propulsion Lab in Pasadena for inspiration and to quench her interest in energy and the vastness of space. Wayne believes that artists and printers have to work closely together to come up with a finished project, the impetus behind founding the Tamarind Workshop. Wayne discusses how working with lithographers she has never worked with before is a “great challenge.” It is like a “dance” with two people who have never danced together before. The artist and printer have to learn to work together. “Judith will do the chemical processing and inking of the images, but if I don’t draw them right, she can’t save me from my own mistakes, and visa versa,” Wayne explains. In creating Near Miss, Wayne and Solodkin experimented with different media to create a print that represents abstract imagery intertwined with recognizable forms. In her prints, she uses subliminal references to knockout mice and the atomic bomb in space. “When I finish a printing, I feel good because I controlled it all myself. When I finish a print, which is collaborative and has a lot of dangerous moments, I feel like I just finished a marathon, I’m tired and I feel lucky.” “A World of Art,” shows how the collaboration between a printer and artist can produce a wonderful piece of art.